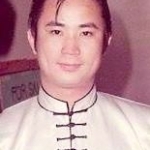 Shifu Brendan Lai learned at Grandmaster Wong Hon Fun or Huang Han Xun own school (not through the Ching Mo). 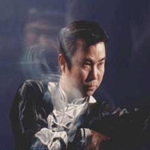 Grandmaster Wong Hon Fun was know as Mantis King and Master Lai was know as Lightning Hands. 2. A calligraphy scroll handwritten by Shifu Wong Hon Fun. Shifu Lai moved to the USA in the early 60’s and is considered to many to be one of the most knowledgeable praying mantis instructors in North America. Residing in San Francisco, California (USA), Shifu Brendan Lai owns a martial arts supply shop and holds instructional seminars around the country on praying mantis and it’s applications. 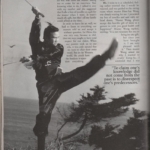 Shifu Brendan Lai was named “1984 Kung Fu Artist of the Year” by the American Magazine “Black Belt”. While Shifu Lai would come down for business to Los Angeles he would stop in and train with Shifu Marquez since 1981 until he passed away. Giving workshops and lectures at the Shaolin Temple school in Lomita. 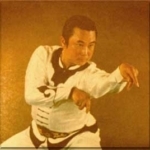 Master Brendan Lai taught Shifu Marquez in Seven Star Praying Mantis for along time before his passing.